We welcome the Clarendon edition of George Eliot’s Middlemarch, which is generally considered to be her greatest novel. It took her about three years to write, and it seems to have caused a good deal of trouble to all concerned. David Carroll's splendid Introduction, although not intended to be biographical, offers the reader a glimpse of the working life of the Leweses. As the Editor tells us, George Eliot left no detailed account of the 'germ' of Middlemarch, but her letters to John Blackwood gave hints that an 'English novel' was in her mind as early as 1867. Then, after The Spanish Gypsy was published in 1868, she seems to have got stuck, in the manner of Mr. Casaubon, in historical research for another work of poetry. 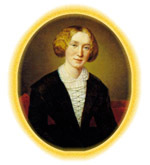 Eventually, the scholar began to give way to the creative writer and George Eliot made a New Year resolution in 1869 to write 'a Novel called Middlemarch', However, the delaying difficulties multiplied. She felt languid, a holiday in Italy intervened and Thornton Lewes returned home seriously ill and died six months later, During Thornton's illness, she wrote her poem, The Legend of Jubal, and work on the novel proceeded at intervals. By September 1869 she had written three chapters of Middlemarch, and at this stage it contained the Vincy and Featherstone parts, with a hero concerned with provincial hospitals.